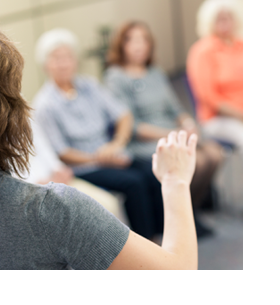 We offer groups for women of all ages, cultures and backgrounds. A therapy group can provide you with longer term support and can help you better understand and manage difficulties? such as depression or anxiety. In the safe environment of the group, you can take the time you need to work through difficulties with other women. Being listened to and understood can also help you feel less isolated. Our groups run weekly on Monday mornings and Thursday afternoons and are held in Central Bristol. Our premises are accessible with a ramp, lift, parking and accessible toilet (on ground floor). You can also tell us of any other access needs you have, so that we can ensure these are supported. You will need to live in Bristol and be unable to afford to pay for therapy yourself to join one of these groups. We may ask for a donation towards the cost of your sessions depending on what you can afford to contribute. Please don’t worry if you can’t afford to make a donation as we can still help you. If you would like more information about our groups, please contact our helpline on 0117 916 641 or 0345 458 2914. (Subject to funding, we sometimes offer short term theme focused groups). If you’re working or can afford to pay, then we have fee paying psychotherapy groups which cost from £15 per session. They run on Tuesday evenings or Wednesday mornings. If you would like more information about these groups, please contact our helpline on 0117 916 641 or 0345 458 2914.